This portrait depicts don Marcos Chiquathopa, a male descendant of Inka nobility who lived near Cuzco, Peru in the 18th century. He appears here elegantly dressed, in a black cloth outfit adorned with gold chains and embroidered lace. 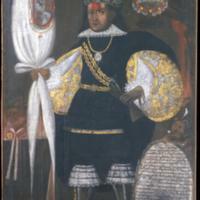 The elaborate banner in his right hand suggests don Marcos served as royal standard bearer (alférez real) at the time this portrait was created. His pose, along with the painted setting, were originally European convention—they would have been foreign to don Marco’s pre-Hispanic Inka ancestors, who honored the mummified bodies of kin, not painted portraits. By the mid-18th century, however, the art of portraiture had become familiar, and meaningful among indigenous Andeans of high social standing. This red curtain, painted as if it had just been pulled back to reveal don Marcos standing beside a table, was a standard feature of European portrait painting. From his gold chain hangs an image of the Virgin Mary. Don Marcos thus appears here as a proud Christian. While not likely to be his everyday dress, and certainly not the clothing of commoners, don Marcos’ outfit—note the lace of his collar, sleeves, and breeches—shows that he sought to appear in his portrait as a man of substantial wealth. He holds a military banner in his right hand. This long pole, swathed in white cloth and emblazoned with a coat of arms, would have been carried in public processions. And it buttresses don Marcos’s statement, made in the text, that he was an alférez real, a royal standard bearer. Charles V originally granted the coat of arms seen in the upper right, with its bicephalic eagle and double palm trees above and tiger and snakes below, in 1545 to Paullu Topa Inka, the scion of the ruling family. Its appearance here links don Marcos to this regal line. The meaning of don Marco’s headdress, the mascapaycha, although rooted in pre-Columbian history, changed dramatically in the colonial period. Before the conquest, the mascapaycha was the exclusive signifier of the Sapa Inka. By the 18th century, a larger circle of wealthy and powerful indigenous leaders who claimed descent from the Inka would wear the fringed headdress on special occasions. A dwarf or miniature attendant seems to hold the text panel. It is likely that this figure was not actually present at don Marcos’ side, but rather is symbolic. Dwarfs often appeared in European courtly portraits and, later, in those of elite Andeans. This one may signal don Marcos’ ambitions to align his image with such representations. The panel lists don Marcos’ titles and honors. It also identifies him as Catholic curaka (leader) of Huayllamba and Colquepata, in the Valle de Yucay, an alfarez real, and a descendant of the third Sapa Inka. The name of the painter is not known. Don Marcos Chiquathopa himself may well have commissioned the image in Cuzco, which had many workshops of skilled painters. The image is likely to have been part of a series of portraits commissioned by don Marcos to depict his ancestral line. The painting is made from oil pigments applied to canvas, a standard combination for portraits and religious paintings created in Spanish America in the 18th century (as well as in Europe and the United States). The image measures ca. 78.5 x 51 inches (ca. 199 x 130 cm), and thus shows don Marcos at life size. The portrait conventions displayed here—the standing figure in elaborate clothing, the cartouche detailing don Marcos’ ancestry and honors, the coat of arms and table and curtain—all have their origins in European courtly traditions. While it is possible to see the flatness of the image, the headdress worn by don Marcos, and the man’s skin tone as uniquely Andean, this portrait owes far more to models imported into the Andes by colonists than to pre-conquest native traditions. Today this portrait hangs in Cuzco, Peru in the Museo Inka. While portraits of native elites may once have been common, many were destroyed by order of the Viceregal government in the wake of the rebellion launched by Tupac Amaru II in 1780. The survival of this painting suggests it may have been owned (and even sequestered) by an indigenous family in or near Oropesa, before becoming part of the collections of the museum. This image suggests much about the cultural complexity of colonial Andean life. If the painting’s account is to be trusted, don Marcos was an indigenous leader of exemplary heritage and great honor. Court records of the time, however, indicate that he was also a harsh man, with a reputation for brutally mistreating his own Andean servants. As a curaca, he would have been responsible for mediating between his indigenous charges and colonial authorities, but clearly he also sought to serve his own needs and interests as well. This image combines European portrait traditions with Andean iconography. By the late 18th century, however, objects such as the maskapaycha were not Inka survivals, they were reinventions. The headdress thus harkened back to the pre-Hispanic past and, in a symbolic way, secured don Marcos’ ties to that history. Such connections to a distinct pre-Hispanic history set don Marcos and others of his class apart from the Spanish and Creole elites also living in Cuzco, even as the tradition of portrait painting connected them. Cummins, Thomas B.F. 1991. "We Are the Other" Peruvian Portraits of Colonial Kurakakuna." In Transatlantic Encounters: Europeans and Andeans in the Sixteenth Century. Kenneth Andrien and Rolena Adorno, eds. Berkeley and Los Angeles: University of California Press, 203-231. Cummins, Thomas B.F. 1999. 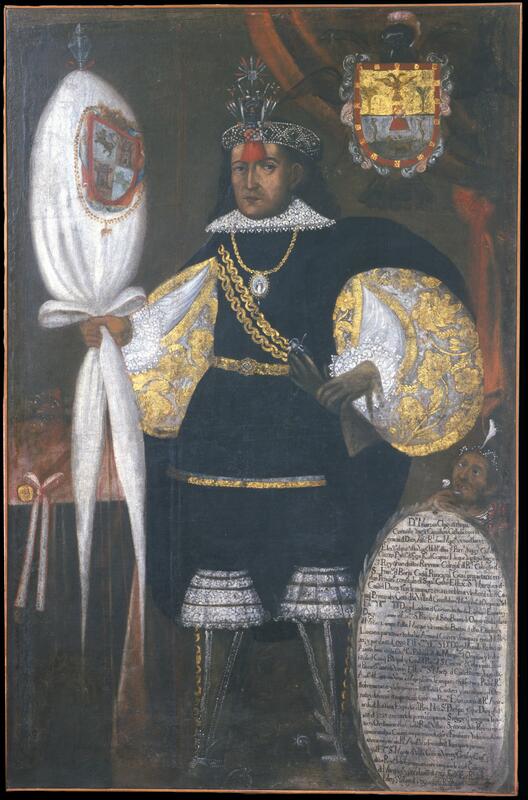 “Retrato de don Marcos Chiquathopa.” In Los siglos de oro en los virreinatos de América: 1550-1700. 1999. Madrid: Sociedad Estatal para la Conmemoración de los Centenarios de Felipe II y Carlos V, 188-189. Dean, Carolyn. 1999. Inka Bodies and the Body of Christ: Corpus Christi in Colonial Cuzco, Peru. Durham: Duke University Press. Gisbert, Teresa. 1980. Iconografia y Mitos Indígenas en el Arte. La Paz: Gisbert y Cía. Libreros Editores. Rowe, John H. 1951. “Colonial Portraits of Inca Nobles.” In The Civilizations of Ancient America: Selected Papers of the 29th International Congress of Americanists. Sol Tax, ed. Chicago: University of Chicago Press, 258-268. Wuffarden, Luís Eduardo. 2004. “Marcos Chiguan Topa.” In The Colonial Andes: Tapestries and Silverwork, 1530-1830. Elena Phipps, Johanna Hecht and Cristina Esteras Martín, eds. New York: Metropolitan Museum of Art, 200-202.